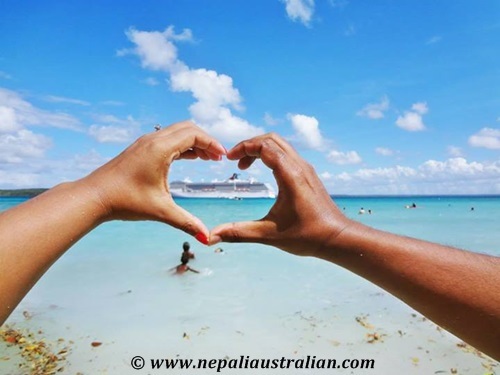 This article was published in +977 (a Nepalese Lifestyle Magazine in Australia) in July 2014 issue. I have always had cursing on my bucket list but never thought it would happen soon. During Christmas 2013, I was desperately looking for places to go for our holiday. 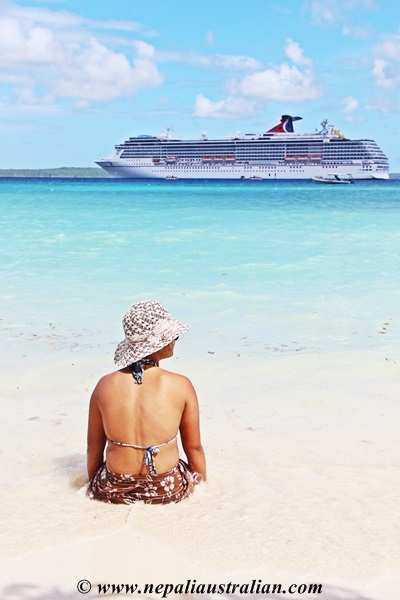 After evaluating our list and considering our finances, we booked our first cruise on Carnival Spirit to New Caledonia and thus our journey began. Once we booked and paid for the trip, it was time to do our research and I have to admit there were so many different opinions on the internet that it was hard for us to make up our mind on what to expect. We both decided that no matter what happened, we would try our best to make the cruise holiday memorable. The first thing we noticed when we went to Circular Quay to board the ship was how massive it was. We joined other excited holidaymakers clearing the customs and boarded the ship. Our luggage was checked in and would be taken directly to our room. Embarkation was as easy as giving them our credit card and getting a Sail & Sign card (Sail & Sign is Carnival’s on board cashless credit program, which allows you to charge all your services and purchases during your cruise to your room.) We were told to wait on the top deck where drinks and lunch was waiting for us until our rooms are ready and the luggage is delivered. As we walked in, we noticed that the ship was huge and amazing with Christmas decoration everywhere. I was excited to see so many different bars, lounges and restaurants on the map. It was as if I was in a different city and it was going to be our home for the next 2 weeks. Once we finished lunch, we were told that our room was ready. We got a room with a window and it was just perfect. It was not very big but enough for two with en suite, a big wardrobe, TV and mini bar. By the time we went to our room our luggage had already arrived. While unpacking, I was really glad that I didn’t need to re-pack until the end of the trip. 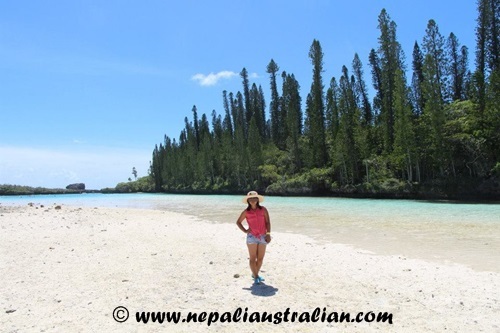 I also didn’t need to learn a new culture, to speak a different language or to stick to transport schedules but could just relax and enjoy our time on board and look forward to an awesome time in New Caledonia. The first impression for both of us was really good, starting from the nice lunch to the room, we were assigned and the things we learned. I was quite surprised by how much there is to do on a cruise ship. It is your choice, if you like to have a day full of nonstop activities or simply relax on one of the deck chairs or hammocks and read a book. Every day there is an enthusiastic voice through the loud speaker system, telling us what is happening that day, where we can go, what we can eat and what we can buy on an hourly basis so you are always informed. We utilise all the facilities on board and were always busy doing one thing or another. My best place to relax was definitely the Serenity area and it was always fun to go and ride in the Green Thunder. Food was always available no matter the time of day or night. We had most of our breakfast and lunch on the Lido deck and dinner in the Empire dining room. The few times we had afternoon tea, we were very impressed by the selections of cakes and fruits. We saw kids running around with pizzas and ice cream all the time. We had no complains about the food at all. 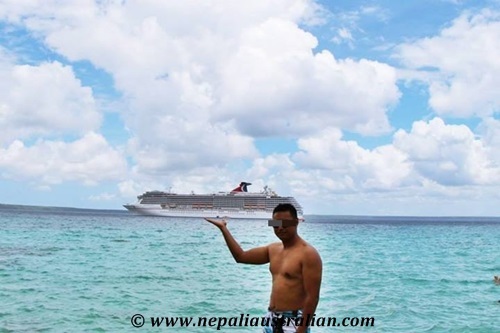 The one thing I really loved on board the Carnival Spirit was the entertainment. There was always something happening especially during the night that we had no time to be bored. Most nights we were going from one event to another fully enjoying each performance. From stand up comedian to hypnotist, juggler, Vegas style show they had everyone covered. If you are into trivia and games, you could always find one area hosting the event. They tried their best to make the sea days more entertaining and full of activates to every kind of travellers. Apart from kids club for the young ones, they could be entertained in many other ways. They will definitely enjoy the rides in Water Park so just get wet. They will love the Chocolate extravaganza day and they will never worry you regarding food. Port days were fun and well managed. If you want to know the details on what to do, please research before you board so you can Google the images and read reviews of the things to do in each island. Disembarkation at all ports was easy and no stress at all. 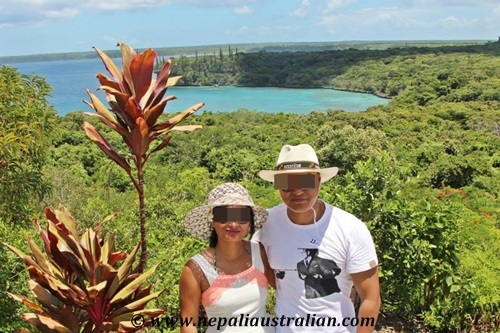 We really enjoyed different ports in New Caledonia but we were glad to come back to the ship and carry on with our holiday with awesome food waiting for us each time. I might sound vain but I also enjoyed the fact they made our room twice a day. Every time we came back to our room, it was clean and the bed was made :). After reading, my experience if you are wondering if cruise is your cup of tea, here is the list of pros and cons I experienced which I hope will help you make up your mind. The most important pro of cursing is that it is definitely value for money. Your cruise package includes room, dining, most entertainment and many extras. Except alcohol and soft drinks, you don’t need to buy anything unless you are shopping. This gives you a clear picture on how much you are going to spend in advance. Less hassle as everything is planned for you. If you are a social person, it’s a great way to meet new friends. We made a few friends while on board. No need to worry about food. It is always there and always changing. No matter what kind of taste you have, they cater for you. I felt more relaxed during the whole trip as there was not much to plan and no running around. There are fewer unexpected problems to solve. Pack and unpack only once. If you are after a quiet, relaxing getaway, then cruise may not be your cup of tea. Motion Sickness can be a problem for many people. Do not forget to take some medicines of it. I hope this has given you some useful insights and helps you make up your mind if Cruising is for you. 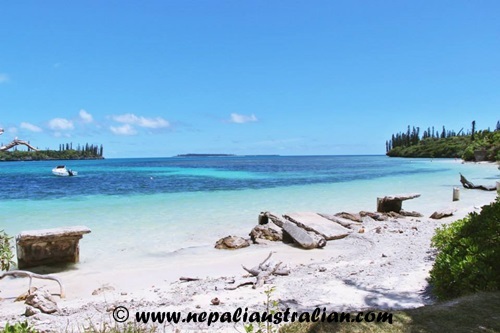 After having a wonderful time in Noumea and Lifou, our last port was Isle of Pines. 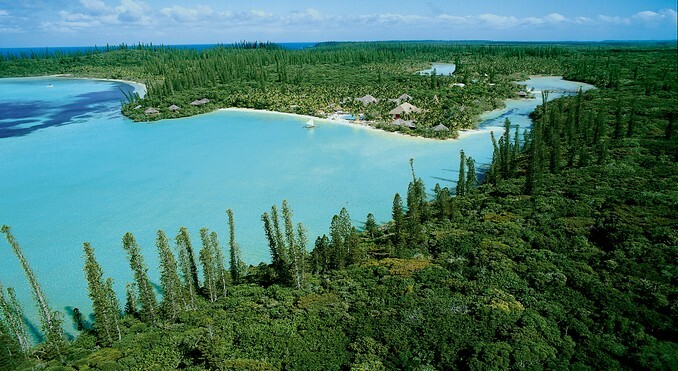 Everyone told me that it is the best place in New Caledonia and when we docked there, we could easily see why. 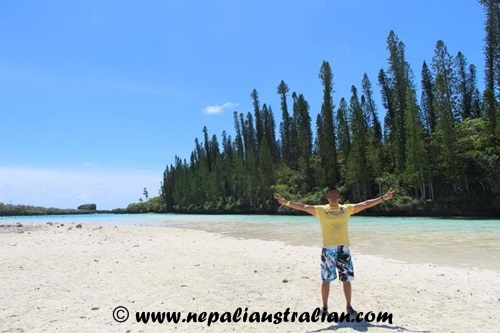 It lived up to my expectations with beautiful white sand, stunningly clear blue water and impressive pine trees. 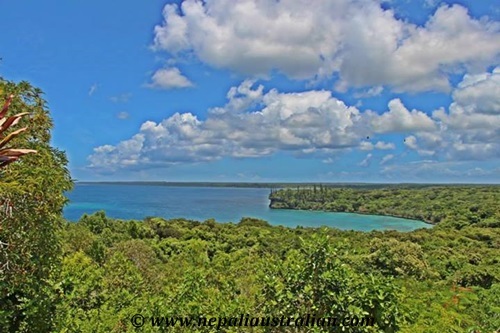 Isle of Pines was dramatically formed by a series of volcanic upheavals and is truly beautiful. After we docked, the tender boat took us to shore, Kuto Bay, and we were greeted by a French Polynesian song and dance by the locals. There is an fort like fence near this port, possibly built by the French to keep out the locals. They also gave each of us a headband with flowers. I realised that they did their best to match the headband with our clothes, mine was pink as I was wearing pink top and AS had yellow as he had a yellow t-shirt on. After that we spotted the stand where you could get your passport stamped for $2 AUD or $200 French Pacific Franc. Unfortunately, we forget to carry our passport with us. That day we had booked a 2.5 hours day tour to snorkel at the Natural Aquarium. 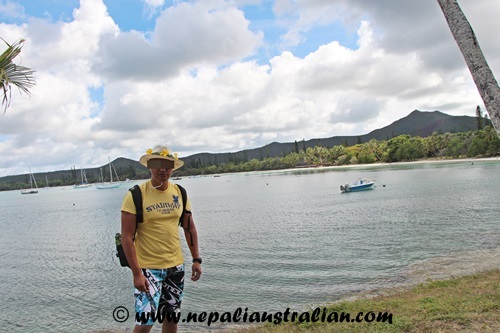 It is a traditional fish reserve and popular snorkeling site which can be found on the secluded lagoon edge of Oro Bay We waited for the bus and traveled to our destination. As we traveled, we got to see the surprisingly diverse landscape of the small island. Most of the land was green and there was hardly any traffic on the road. Along the way we passed cows, local villages, lots of mango trees laden with fruit and plenty of jungle. After about 20 minutes, we arrived at our destination, got out and walked to our destination. After a short walk through knee high water we arrived at the natural aquarium. The place is just beautiful with blue water, green trees and lucky for us blue sky as well. We set eyes on this incredible pool of blue water surrounded by the pine trees; we knew it was well worth the journey. It is a protected area which many fish have decided to call home. 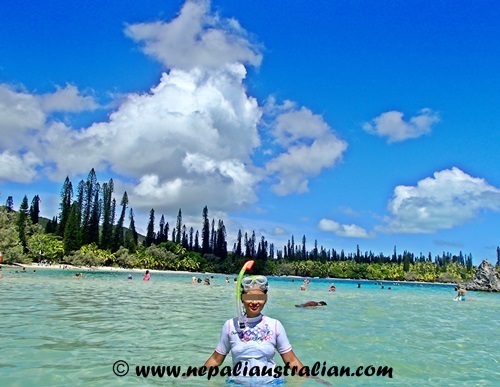 Like other parts of New Caledonia, we saw lots of dead corals and I was glad that both of had reef shoe on. Oro Bay (Baie d’ Oro) is an absolute ‘must-see’ destination . It would have to be one of the most beautiful and stunning natural sites I have ever seen in my life. 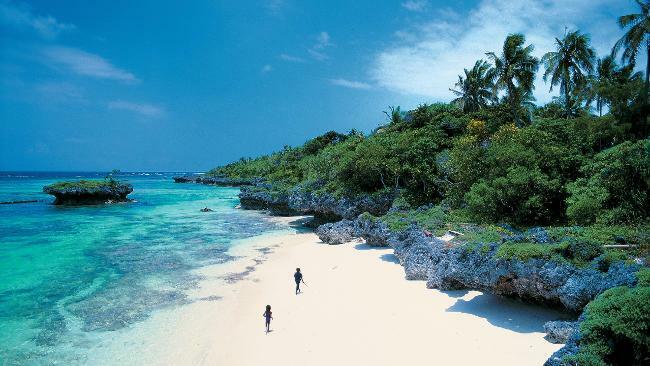 It is surrounded by dense vegetation with much of it being the Island’s incredible pine trees; the sand is the whitest I have ever seen and the water the most serene shade of turquoise. We dumped our stuffs at the end of the beach and just jumped into the water. There were already some tours there already but it was a good thing because one Japanese group had bread with them, which meant there were so many fishes closer to the shore. The water at Oro Bay is the clearest I have ever snorkeled in. It is like looking through the cleanest fish tank. You can definitely see from the surface all the way to the white sandy bottom . However, if you have been snorkeling in the Great Barrier Reef, you will not find the coral to be as vibrant or as interesting. We saw plenty of ‘Nemo’ fish and zebra fish and other fish of many different kinds and in terms of coral we saw clams in a range of colours and many other beautiful types of coral. We both snorkeled and had so much fun chasing the fishes. The fish there were so confident that as I swam over them they didn’t flinch, just went about their business. It was so much fun that I couldn’t believe that the tour was over so quick. We packed and headed to the bus to go back to Kuto bay. 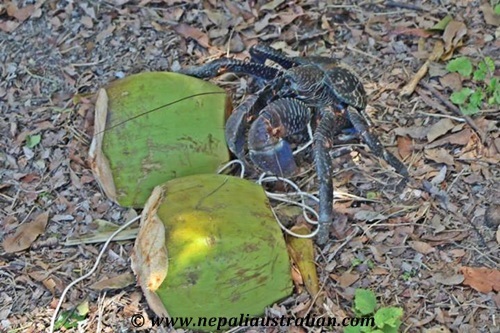 Before we boarded the bus we were served fresh fruits, watermelon and papaya and fresh coconut as well. They were very yummy. 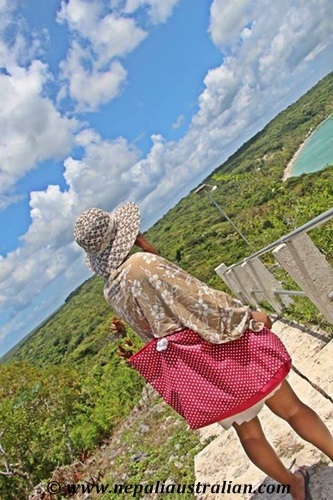 Once back at Kuto Bay, we decided to walk around and find a good spot. Snorkeling was next on the plan in Kanumera Bay which is just opposite Kuto bay. There is a large rock in this area called La Rocher just off shore, which is completely off limits as it is sacred to the locals.. We took a few photos and went straight into the ocean to find more fishes. The photos taken in Isle of Pines are one of the best photos of the trip. The water took us by surprise being a little colder than we thought and was extremely salty. There is coral in the bay but pretty old and mostly dead. 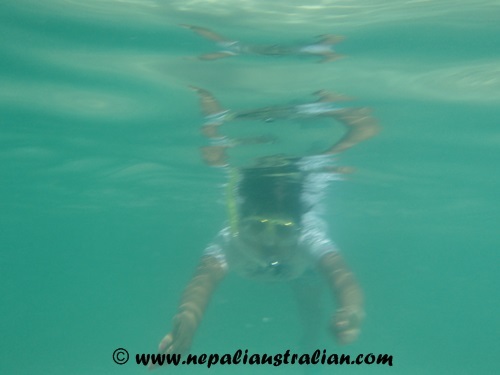 The fish life is lovely and it’s easy to snorkel and watch them, the water being quite refreshing. It was not as good as Oro bay but still really beautiful. We snorkeled around the “island rock” got some great photos while in the water and some beautiful underwater shots too. I really didn’t want to come out of the water but we had to. After snorkeling, we walked around a very small market area to get some last minute souvenirs. I ended up buying a nice turtle made out of wood and shell. Overall, we had a wonderful experience and loved Isle of Pines. We returned to the ship on a tender around 4pm and retreated to our cabin for some much needed rest. 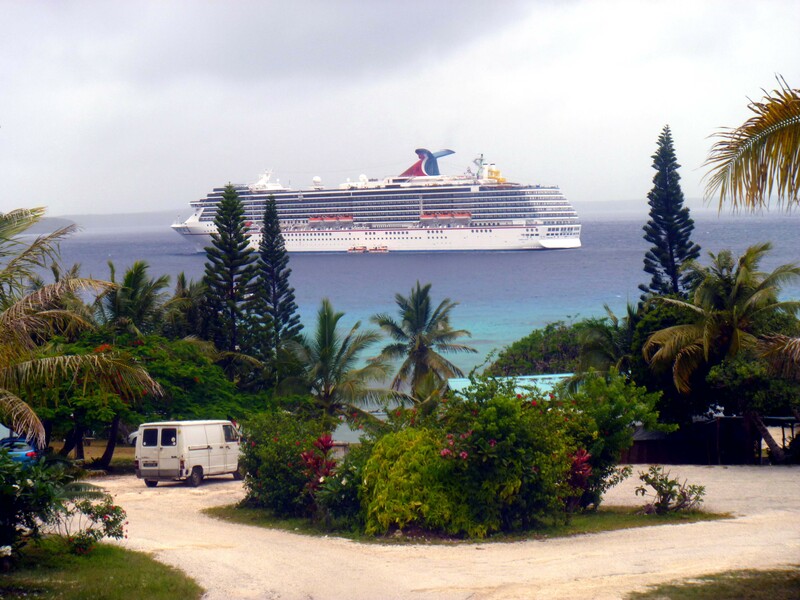 Our next port of call was Lifou. Both I and AS were very excited about this place as we had done some research beforehand and knew the things to do. 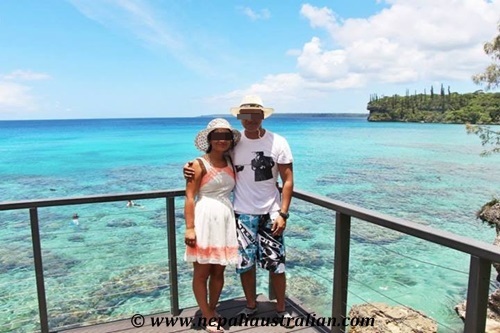 We didn’t have a tour booked for Lifou as we wanted to tour the island ourselves. 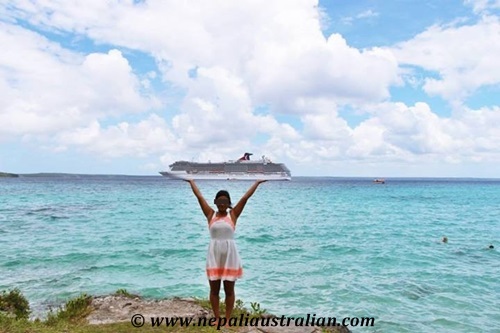 Lifou is the largest atoll in the world – over 1,200 sq km – but it is still delightfully ‘remote’ and we had to drop anchor offshore and tender in. It is so different visiting an island from a cruise ship as opposed to with another form of travel. Normally I would have done extensive research before going on a holiday but this time I didn’t do much as we were going on a cruise. But going on the tour in Noumea previous day we had the experience how tours normally were organised from inside the ship. If you go on a tour, you use Australian money and pay about 2 – 5 times as much as you would if going it by yourself. Because we’ve traveled quite a bit before, it sounded like a great idea to ditch the tour and make your own tracks. I was a bit worried but AS convinced me that it will all be good. We had breakfast on the ship and waited for our tender boat to take us ashore. It was a beautiful sunny day and I couldn’t wait to go and swim in the water. As it looked like it might be a while before our number was called, we went to the top deck to take some photos. From the deck of a cruise ship Lifou’s golden beach glows against the brightest of green backdrops, made up of coconut trees and a variety of smaller palms. The vegetation is so dense it blocks out everything behind. 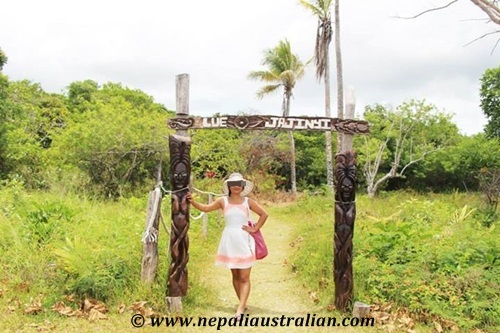 Once we stepped on Lifou Island we knew we needed to find a church and a marine park. As we made our way to the church, we met a staff from a ship who told us that we were going the wrong direction and pointed out to the right one. It looked really far and it was getting hot. As we walked towards the direction pointed out by the ship staff we saw heaps of people coming back. I stopped one of them just to make sure we were heading in the right direction and luckily we were. 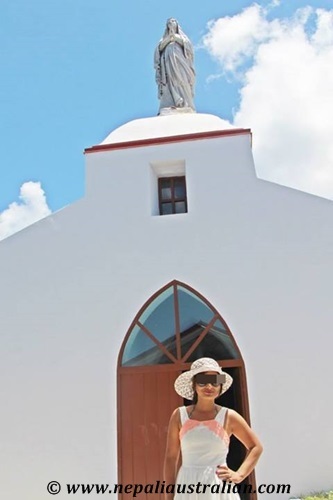 The white building we had seen from the ship turned out to be the church of Our Lady of Lourdes, built by Catholic missionaries in 1898. 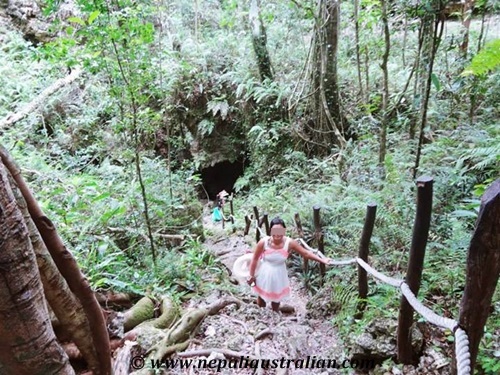 It takes about 25 minutes at a slow pace to get there because the weather is hot and humid year-round, but the climb is gradual, with only one steep section. We are told about 200 locals gather once a year for a mass to celebrate the founding of the church. Sweeping ocean views made it worth the climb on the brilliant, cloudless day, and the sea breeze has visitors cooled down in no time. 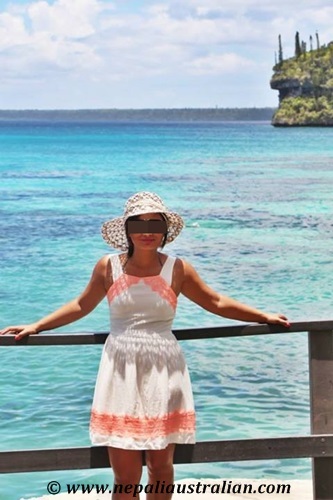 The church provides a 360 degree view of Lifou – a sight not to be missed. The descent takes half the time. 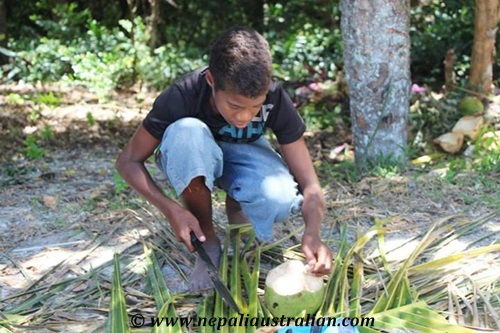 As we were making our way back we saw two local boys selling fresh coconut juice, we grabbed one each and it was nice and refreshing. I wished it was cold too but it was still worth spending $6 for 2. They also had a mud crab tied to a rock so we took some photo with it. On the way back, we stopped at the beautiful Jinek Bay. 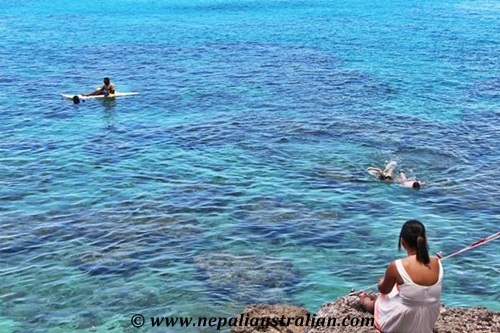 This snorkeling beach is renowned for its vast expanse of corals and wide variety of tropical fish. Couple this with warm and crystal clear water and this provides the perfect platform for a stunning afternoon of snorkeling. I really wanted to snorkel before but you need a permit and they were not selling any on site, we couldn’t get any permits on ship as they had run out of it. The place looked beautiful from the top itself and we learned that dozens of varieties of fish were found there, including angelfish, clownfish, lionfish, blue stripe snapper, grouper clownfish (Nemo) and butterfly fish. As we couldn’t swim, we took as many photos as we could and decide to go and snorkel elsewhere on the Island. As we were returning, we met a couple, table mates for dinner on the ship, who informed us that there was a beautiful cave on the other side of the Island. As we had plenty of time, we decided to go and check that out too. We started walking up a hill along a road and passed a lot of people coming the other way. Everyone we met said that the place was really beautiful so we kept on walking. It was really hot, and we were a bit tired by then. We finally saw a church, and around the side were a few men sitting in front of a sign pointing toward the caves. As we walked toward the cave, the men came and asked if we were going inside. He wanted money and we managed to get a good price ($10) for the two of us to get in. He wanted more but we said that’s all we had and he lets us go on. As we walked inside, I could see that the path was small and steep. The path got rockier and the trees bigger as we continued towards the cave. I was a bit sacred when we had to climb through tight spaces and down wet rocks. I was thinking it was a bad idea when all I had to hold was a thick ship rope that lined the path. 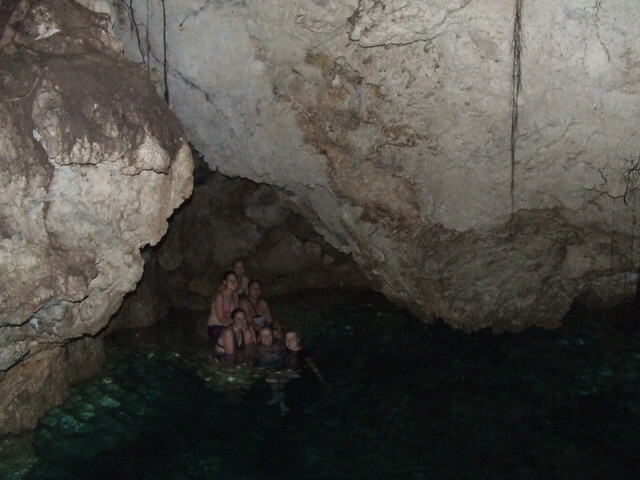 Inside the cave, it was dark but there was a large pool of water below us. There were a few people already jumping into the pool and they told us the water was cold and invigorating but the pool was very deep. 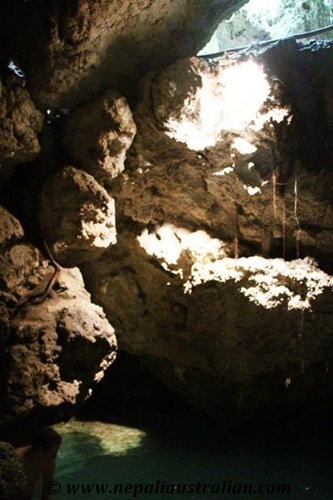 The rocks around the pool were limestone and when we shone the torch down we could see tunnels that seemed to go forever. Tree roots hung down from the rocks and the whole place was scary but beautiful. I really wanted to jump into the pool as everyone seemed to be doing but we decided not to. We still stayed there for a while and took some photos before climbing up the same narrow path back to the top. We headed back up the path back to the area so we could swim and snorkel. The beach area was very long so we picked one spot left and our belonging and went to snorkel. The water was warm but as the sand was too fine, you have to go a bit further out to see the beautiful corals and fishes. As we were swimming, someone told us there were many turtles a few meters away but we didn’t really see them. Still, we managed to see lots of corals and fish and it was so much fun. We took some nice shots with the Carnival Spirit in the background. Afterwards we were tired so we went to the market where local crafts and colourful shirts and sarongs were on sale. 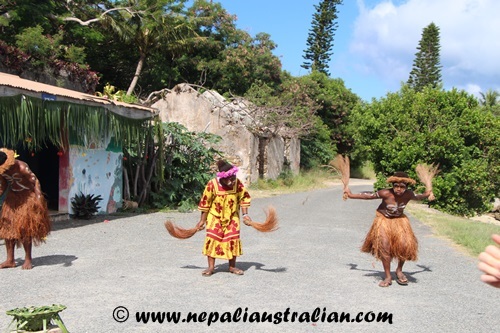 Our day on Lifou was amazing; even though we didn’t book the tours we were happy to discover so many things in one day. 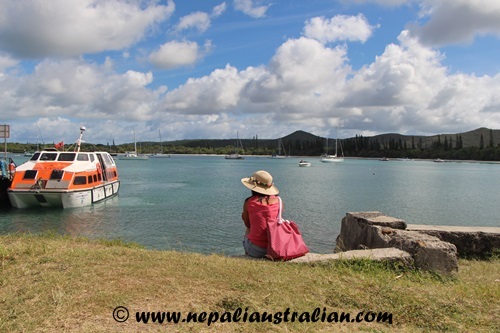 As I mentioned before, we will be going on a Cruise to New Caledonia soon and I am counting down the days until the day arrives. This year has been really long and I am glad holiday time is almost here so I can relax and enjoy the remaining days of this year. We will be spending Christmas on board so it will be a different experience. I have to say I am a bit anxious about this particular holiday because I will be spending most of the time in the ship. This is our first cruise and being first time cruisers we were a little bit apprehensive and are doing a lot of research. I have sailed before but never been on a cruise so I am having mixed feeling. 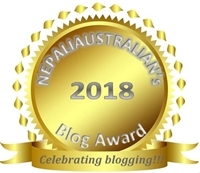 I am busy doing my research to make sure I don’t make any mistakes and reading everyone’s’ experience I can see that most of them really enjoyed it so I am hoping to come back and report that I had a fun holiday. The most worrying part for me is seasickness. I normally don’t get sea sick and I am going to take heaps of medications as well to help me be normal but sometimes you can plan all you want and still things may not work out so a bit worried about it. Most of the holidays we go to, I have full day plan for nearly all days so I know what I am doing and in control of everything but this holiday we are going to have few sea days and I have no idea how we should spend those. I have been doing my research and there seems to be heaps of things to do in Carnival like going on water ride, golfing, swimming or just relaxing but still not having a proper plan is making me worried a bit. Apart from that, I think most of the things should go smoothly. I will spend 2 weeks with my loving husband by my side just relaxing, swimming, snorkeling, eating and enjoying ourselves. Can’t thank him enough for make my birthday so special and making me so happy with the cruise as a birthday gift. 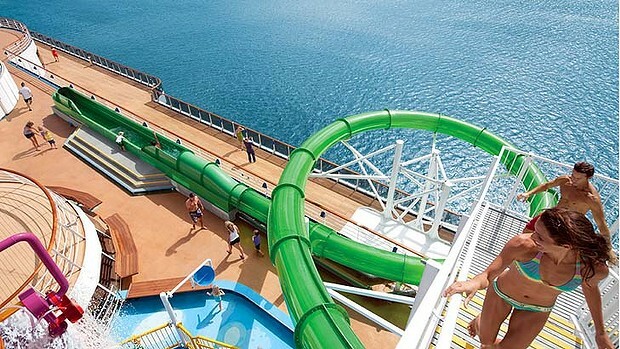 If anyone has been on Carnival Spirit before, your suggestions will be highly valuable. 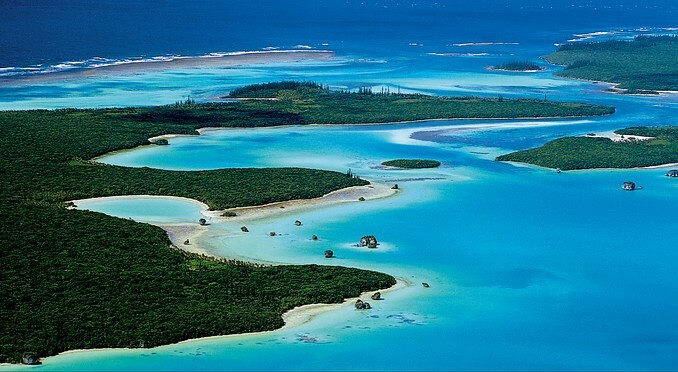 One of the stop for us is Isle of Pines and I have seen so many amazing photos from this place. 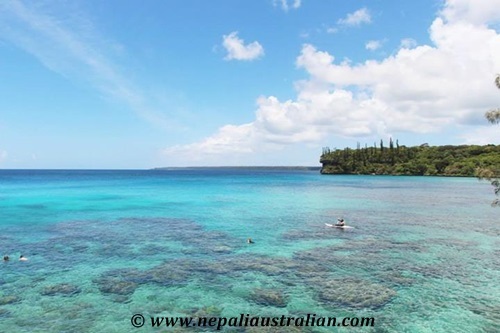 Isle of Pines was dramatically formed by a series of volcanic upheavals and is truly beautiful. 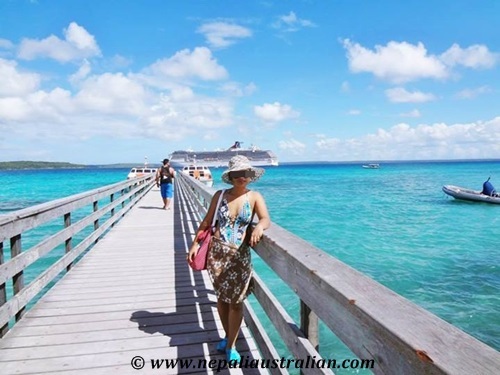 Another stop is Lifou which is within the Loyalty Islands of New Caledonia and known for their coral reefs and limestone caves. Hope this holiday will be exciting and fun so we can book more cruise holidays in the future too. See you with my next post soon.